This year’s fall fashion colors exude a unity of strength, confidence and complexity, according to the Pantone Color Institute. So, be on the lookout for a fall palette led by the blue family, with gray, red, dusty cedar and spicy mustard to complement. I am so excited about these luscious fall fashion colors! And, this year’s fall fashion trends offer something for everyone, including the resurgence of a fuller boot cut pant for women and men. Check out some of my favorite fall fashions for 2016 click on the links to shop for them! #1 – Velvet makes a big statement this season. A classic blazer adorned in military gold buttons is a good choice paired with a ballerina velvet shoe that ties around the ankle, by Stuart Weitzman. Find the blazer here! Find the ballerina velvet shoe here! #2 –Show your sparkle this season with uptown dresses that shimmer and shine for any night out! Find it here! #3 –A pinstripe suit for men becomes an easy daywear option as a fitted single breasted suit. Find it here! #4 –Today’s version of a duster is not what your mother wore. Simple and chic—especially in navy this season! Find it here! #5 –Choose a boot versatile for your wardrobe, whether short or tall, skinny or chunky heeled, or leather or velvet. Find the chunky heeled boot here! Find the leather boot here! #6 -Fashion sneakers stay the trend. Check out these great options to pair with jeans or casual wear. Find it here! #7 -Hoodies and casual street-wear give workout wear a break! Find it here! #8 -Lace continues to add that feminine sensual touch to garments for daytime to evening wear. Find it here! #9 –Women who need more than a skinny pant, rejoice! The boot cut pant is back. offering options in velvet, cotton and denim. Find it here! 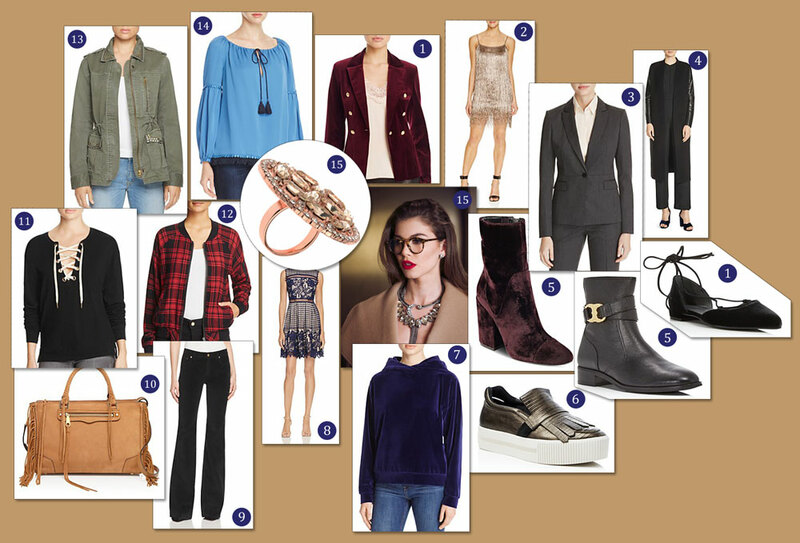 #10 –A little fringe goes a long way in this fall’s handbag, boot or blazer—adding punch to your style! Find it here! #11 –Oversized keyholes, shoe laces and garment embellishments adds an edge to your everyday chic. Find it here! #12 –Go plaid in shirt, jacket or dress in any color for an easy 90’s vibe with little effort! Find it here! #13 –This season’s military jacket will be adorned with beads, trims and ruffles to be layered casually along with boots and dresses. Find it here! #14 -Peasant tops with wide arm bands and bohemian dresses that flow will continue to add to the 70’s vibe. Find it here! #15 -Chokers are the biggest statement of the season. You’ll find a variety of stones and fabrics in styles from the simplest to the most ornate. Pair a trendy choker with a wow-factor ring to make a grand statement! Find the choker here! Find the ring here! Thank you, Rebekah Price, for sharing your fabulous jewelry! Be sure to check out her entire line at rebekahprice.com!